Recombinant DNA (rDNA) is made of segments of DNA (polymers of deoxyribonucleotides) from two or more sources. Nature has been recombining DNA in living cells for eons, but humans have only recently discovered the means to carry out this operation in the test tube. DNA is the molecule of heredity, and the procedure used for preparing rDNA is referred to as genetic engineering. The biotechnology industry and much of modern medicine, basic research, and agriculture depend on the use of rDNA. The discovery of restriction endonucleases, enzymes that reproducibly cleave double-stranded DNA molecules at specific sequences, paved the way for the development of rDNA technology. Restriction endonucleases are produced in bacteria as a defense mechanism of that bacterium to restrict the growth of invading bacterial viruses; they act by destroying viral DNA. The enzymes hydrolyze or "cut" specific sites within a DNA molecule. In 1978, the Nobel Prize in medicine was awarded to Werner Arber, Daniel Nathans, and Hamilton O. Smith for the discovery and investigation of restriction endonucleases. The cuts made by these enzymes often leave single DNA strands with sticky ends due to the asymmetry of the cut (made to a double-stranded molecule) and the tendency of the bases in DNA to form hydrogen bonds with complementary bases on another strand. Scientists realized that these enzymes could serve as a powerful tool for manipulating DNA in a controlled way. The 1980 Nobel Prize in chemistry was awarded to Paul Berg for constructing the first recombinant DNA molecules. When scientists became concerned about whether this new technology posed risks to humans and the environment, there was an unprecedented (and temporary) suspension of experiments using rDNA. In 1975, a conference was held in Asilomar, California, to assess such risks, and it was determined that most rDNA work should continue as long as appropriate safeguards were in place. A Recombinant DNA Advisory Committee was established through the auspices of the National Institutes of Health to set up guidelines and assess risks and benefits of proposed projects using rDNA. That committee, composed of scientists, physicians, ethicists, and legal experts, has met regularly since that time. When a DNA carrier, called a vector, and a targeted DNA sample are treated with the same restriction enzyme, the resulting fragments are left with matching, or complementary, sticky ends. When mixed, the two samples of treated DNA will "stick" together, and another enzyme, DNA ligase, will seal pieces of DNA together with the formation of covalent bonds (see Figure 1). Vectors are often plasmids, small extrachromosomal and circular DNA that are incorporated into bacterial DNA such as that of E. coli, so that the inserted or cloned genes can be reproduced manyfold and products of the inserted genes (protein molecules) can be manufactured, sometimes in large quantities. Some vectors are designed to induce protein synthesis from the information in the inserted genes. Other vectors are designed to deliver large segments of DNA to specific cells. Essentially every area of biological research has been affected by the use of rDNA technology. Protein structure/function relationship studies and gene expression and regulation research have been enormously enhanced by this powerful tool. Transgenic animals (into which DNA from another species has been inserted) have been bred to expand the study of human biochemical processes and diseases. Transgenic mice that are highly susceptible to breast cancer or Alzheimer's disease have furthered the understanding of those diseases. Modern medicine is inextricably linked with rDNA technology. Gene therapy replaces defective genes with functional ones, delivered to the patient by way of a suitable vector, usually a disabled virus. The first moderately successful gene therapy was instituted to treat an inborn immune deficiency disease (ADA deficiency) caused by a defective enzyme, adenine deaminase. Cancer research and treatments as well as some vaccine development make use of rDNA technology. Attempts to modify animals genetically in such a way that organs suitable for transplant into humans may be harvested are now being made. Agricultural uses of recombinant DNA technology are expanding. Genetically engineered bacteria sprayed onto strawberries protect the strawberries from freezing. Genes that promote herbicide resistance are incorporated into plants so that herbicides can be used for no-till farming. Some plant species have been transformed by rDNA containing genes that promote resistance to insects and pathogens. Figure 1. Scheme for producing an rDNA structure made from a plasmid and DNA to be cloned. proteins. Transgenic cows that produce human milk for use in baby food have been bred. In 1980 the verdict of a landmark case heard before the U.S. Supreme Court stated that a genetically engineered bacterium, designed to digest oil in oil spills by researchers at Exxon, could be patented. Recombinant DNA technology was used as an artist's tool in a macabre incident in which a jellyfish gene for a green fluorescent protein, often used in research as a marker for gene transfer, was inserted into a rabbit, making the rabbit fluoresce under green light. This and other dubious uses of rDNA technology have engendered a number of ethical, economic, safety, and legal debates. SEE ALSO Clones ; DNA Replication ; Hydrogen ; Restriction Enzymes . Eun, Hyone-Myong (1996). 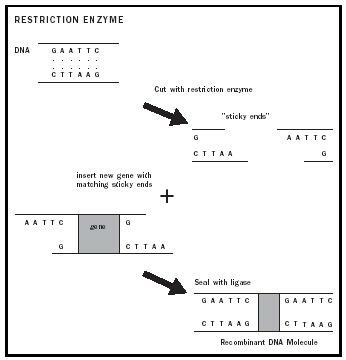 Enzymology Primer for Recombinant DNA Technology. San Diego: Academic Press. Garrett, Reginald H., and Grisham, Charles M. (2002). Principles of Biochemistry: With a Human Focus. Fort Worth, TX: Harcourt College Publishers. National Institutes of Health. Office of Biotechnology Activities. Information available from http://www4.od.nih.gov/oba/ .